You can manage your GQueues account by going to the Account tab in Settings. The My Account section of the Accounts tab in GQueues Settings tells you what version of GQueues you are using, the expiration if applicable, and who is responsible for your license if it was purchased by someone else or as part of a BUSINESS subscription. GQueues Lite - no expiration date, with option to subscribe or start a free trial. GQueues license purchased by another person. Your name and profile image in GQueues are synced down from your Google Account. To change your profile image click your image at the top-right of the My Account page and click the Change button. To change your name go to the Personal info & privacy section and click the link for Your personal info and update your name. Once you have saved your changes, sign out of GQueues and sign in again and your updated info will appear in GQueues. The primary email address for your Google Account is used as the email address for your GQueues account. The primary email address CAN be changed for a G Suite account through the G Suite Admin panel. This happens most often when an employee leaves an organization and the G Suite account is re-used for the new employee. When you change the email address of a G Suite account, you can update the email address of the associated GQueues account by logging out of GQueues completely and logging back in. When you re-login, GQueues will detect the new email address and prompt you for action. In most cases you will want to choose the first option and update the email address for the GQueues account. With this option, the email address and all assignments and shared queues are updated appropriately. All data is preserved. If you need to wipe the GQueues account clean, you can cancel the account and the next time you login it will start fresh. The GQueues for YOU Subscriptions section of the Accounts tab in GQueues Settings displays the accounts for which you have purchased individual subscriptions. You will also see which subscriptions will automatically renew when the license has expired (grouped by order number). Auto-renew helps you avoid any disruption in service to your users. However, you can prevent an order from automatically renewing by clicking the Turn Off Auto Renew button. If you paid for your subscription with PayPal you can also disable auto-renew by logging in to PayPal directly. In PayPal click on the gear menu at the top-right of the page and then the Payments tab and "Manage Pre-approved Payments." From there you can click on the GQueues transaction and choose Cancel. To update your credit card information used for auto-renew click on Update billing info for the appropriate order. If you purchased your subscription using PayPal you can update your default payment info by logging into your PayPal account directly. A GQueues for BUSINESS subscription allows you to easily manage GQueues licenses for all users on your team. You also receive bulk rate discounts the more licenses you purchase. To purchase a BUSINESS subscription enter your company's domain, the quantity of licenses desired, and the email address of the person you want to manage the licenses on the order form. The more licenses you order the better rate you receive. Licenses in your BUSINESS subscription can be issued to or revoked from users by going to the Account tab of GQueues Settings. The license admin designated on the BUSINESS subscription order form will be able to issue and manage licenses. Also, if you have installed GQueues on your G Suite domain then any Super Admin will be able to manage GQueues licenses. Click manage next to your BUSINESS subscription to administer licenses. Licenses can be automatically issued to users on your domain when they access GQueues (as long as there are licenses available). You can turn this setting off if you do not want licenses issued automatically. You can explicitly issue a license to a user by entering their email address and clicking Issue License. If you have installed GQueues on your G Suite domain a list of users will be shown to make issuing licenses even easier. You can change the person authorized to manage your BUSINESS licenses by going to the Account tab of GQueues Settings, clicking manage and then Change Admin. NOTE: After entering the email address of the new admin, you will no longer be able to manage the licenses unless you are a G Suite Super Admin. 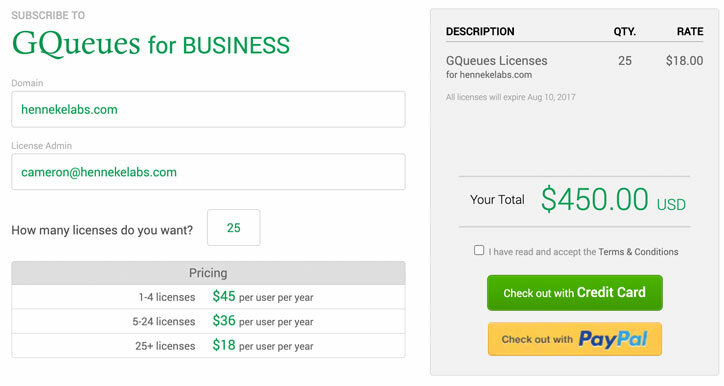 To add more licenses to your BUSINESS subscription go to the Account tab of GQueues Settings, click manage and then Buy More Licenses. The additional licenses will have the same expiration as your existing ones and will be prorated accordingly so your subscription remains on the same billing cycle. The base rate for your licenses will be based on the total number of licenses on your domain. So if you initially purchased 10 licenses at $20/user/year, and then later add 15 more, your total would be 25 licenses, so you would get the 15 new licenses at the discount rate of $10/user/year. 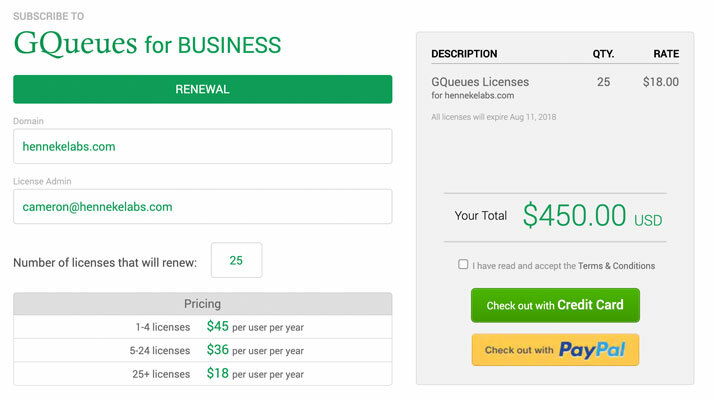 If your BUSINESS subscription was set to auto-renew, the previous repeating charge will be cancelled and a new repeating charge will be established for the new total number of licenses. You will receive an email that confirms the old repeating charge has been replaced by the new one. BUSINESS subscriptions renew automatically by default to avoid any disruption in service to your users. However, you can prevent a BUSINESS subscription from auto-renewing by going to the Account tab of GQueues Settings, clicking manage and then Turn Off Auto Renew. To update your credit card information used for auto-renew go to the Account tab of GQueues Settings, click on manage for your BUSINESS subscription and then on Update billing info. If your BUSINESS subscription is not set to automatically renew you can renew it manually by going to the Account tab of GQueues Settings, clicking manage and then Renew Now. You can renew in advance and the new expiration will still be set to a year from current expiration. To cancel your GQueues account go to Settings, click on the Account tab, and click Cancel GQueues Account. WARNING: This will delete all your GQueues data and it cannot be recovered after cancellation. NOTE: Subscriptions are non-refundable, so if you cancel your account before your subscription expires you will NOT be issued a refund. Confirm you want to proceed with the cancellation. You will be logged out of GQueues and will be sent an email confirming the cancellation is complete. If you have purchased an individual subscription you can go to the Account tab of GQueues Settings to transfer it to a different account. Enter the email address and click Transfer Subscription. This will NOT transfer your data. Use the Export / Import feature to transfer data to another account. Once you transfer your subscription your account will be switched back to GQueues Lite. You will not lose any data, but you will no longer have access to premium features. You can only transfer to an existing GQueues account. If you want to transfer to a new account, first login with the new email address so a new GQueues Lite account is created, and then initiate the transfer. If you have a paid subscription and love using GQueues you can earn money by referring others. Check out the GQueues Referral Program overview for full details on how to get started.